Shriram properties, which is a part of the Shriram group is one of South India’s most prominent construction group. Since its inception in the year 1974, it has built up an empire worth 90,000 crore rupees. Also, with its nationwide operations, it has delivered a built-up space of more than 20 million sq ft and presently has over 45 million built-up space under construction. The two most talked about projects by Shriram properties is the Shriram Divine City and Shriram Code Kovil in Chennai. Shriram Divine City is a mini township spread across 30 acres of land with a lush green landscape. Situated in the city’s most well-connected area of Mangadu, this project is presently one of the most sought-after real estate housing projects in Chennai. With an economical pricing of INR 3750-3790/sq ft, it is currently the most affordable housing solution for medium budget holders. In stark contrast to the pricing, status is the project’s high quality and standard. The township accommodates a total of 2600 housing entities with 4 grand clubhouses. 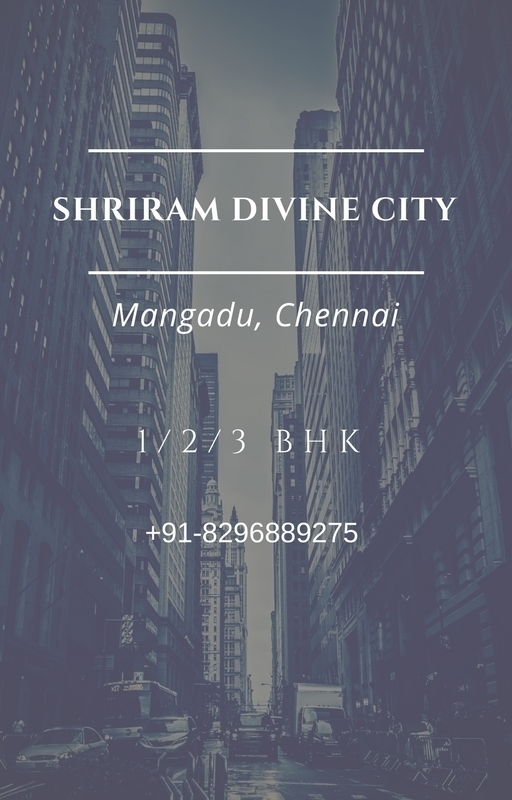 Shriram Divine City provides extremely easy connectivity to Central Chennai, IT Parks, industrial zones etc. It also is surrounded by around 9 hospitals, 10 top schools, 9 colleges, both engineering and medical and a variety of other conveniences within a radius of a few kilometers. The housing project also hosts a wide spectrum of other activities like kids play area, garden and sitting area for senior citizens, various sports facilities. There also are facilities of a supermarket, convenience store, clinic, crèche and school bus pickup point among others. Apart from the facilities mentioned herein, the project comes with an additional security and quality standard of the Shriram group. This project is a mini city being constructed near Porur, Chennai by the Shriram group. It offers an elevated lifestyle with all the state of art facilities suitable for modern luxury. This articulately planned mini city is what intends to become synonymous with affordability, beauty, and luxury. The location of the project is central to Porur with a distance of merely 5 kilometers. Also, upcoming infrastructure such as Poonamalle, Kathipara Monorail, Chennai, Bangalore Industrial Corridor (CBIC), and Maduravoyal- Port Expressway will increase the connectivity and assist in rapid development. The strategic location and intrinsic planning will give additional milage in terms of traffic, and comfortable access to central city locations like Guindy, Vadapalani, Manapakkam etc. The project is surrounded by various amenities like top-notch hospitals, high schools, degree colleges, engineering and medical colleges etc. Apart from these, there is also easy availability of supermarkets, convenience stores, medical facilities like doctor’s clinics, crèche, school bus pickup point to name a few. The project shall also include kids play area for children’s recreational and outdoor activity purposes, garden with seasonal flowers and beautiful shrubs, gym for physical fitness of the members, activities complex for senior citizen’s and adult member’s recreational purpose.